For 135 years, give or take a few breaks, five generations of the Heighington family have been in the laundry business. The current generation includes Richard Heighington, who owns Spotless Eco-Friendly Dry Cleaners and Laundromats and his brother Shaun, who owns Spotless Uniform. Both operations are in the northern British Columbia city of Prince George. In nearby Terrace, uncles Bryon and John own Superior Linen. It all started with great, great grandfather James, who shipped out of England with the Royal Navy in 1875. He joined a the age of 13 and worked in the ship’s laundry. The prince of Wales, later to be George VI, was on board and a special friend to James. 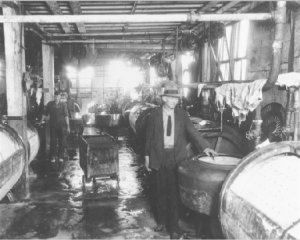 From this encounter with soapsuds to the present, the family has operated both laundries and dry cleaning plants, with each generation turning over its expertise and assets to the next. Eventually James left the navy and, with a new bride, immigrated to Canada. He filed for a homestead at Bittern Lake, Alberta. For three winters the couple escaped the cold and travelled to Florida, where they worked in the laundry of the Tampa Hotel. They were paid in gold and accumulated enough in three years to buy a business in Canada. 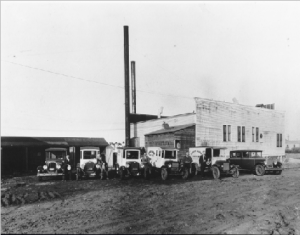 After several false starts as entrepreneurs, they opened a laundry in 1912 in Camrose, Alberta. 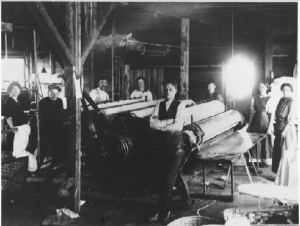 Although sons James and Frank worked in the laundry for a while, they left to start a sawmill. However, the laundry business soon pulled Frank to Edmonton, where he went to work at the Royal Alexander Hospital Laundry. Later he started Superior Laundry, and persuaded brother James to join him. The business flourished, but unhappily James was killed in 1928 while repairing a belt on the drive motor. More bad luck followed, as the Depression forced the business to close. The equipment was shipped to the old family homestead in Bittern Lake. For 13 years this equipment sat outside in tall grass. It included a Nelson & Bruter flatwork ironer and a 71/2- hp steam engine, originally used in well drilling. In 1948, a new generation of Heighingtons decided to go back into the laundry business. 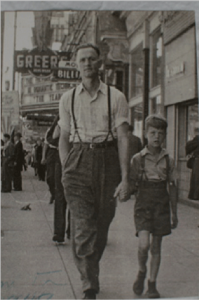 The promoter, also named James, persuaded his brother Norman, a railroad fireman, to join him in setting up a laundry. They rented a truck, got the equipment out of the weeds and drove it to Prince George. The new Laundry, called the Prince George, was a success,outgrowing it’s original premisis and eventually buying out its competitor, a dry cleaner. In 1965 Norman went to nearby Terrace and purchased Time Cleaners, building the business for 15 years and then selling it, while retaining the real estate. Five years later the owners walked away and he had to take the business back, with debts and a 50% loss in volume. The Heighington family rallied around with money, business know how and muscle to build the business back up. They renamed it Superior Linen. Today there are three family businesses in northern B.C. that can trace their origins to gold from Florida, or even to the Royal Navy.